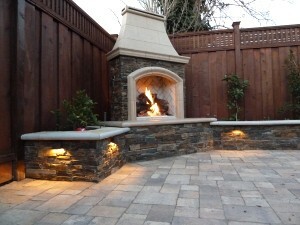 The addition of fire can add warmth to your Wisconsin outdoor space and create an amazing outdoor living experience. With an outdoor fireplace, your patio will give off a welcoming glow to your guests. As such, here we talk about the benefits of an outdoor fireplace and the importance of hiring a professional like Landscape Specialists for installation. It Provides an Option: Some cities have ordinances restricting or completely outlawing outdoor fires and even patio firepits. A fireplace, almost always, falls under a different category. Usually, that of a grill when used for cooking or a patio heater when used as a heat source. 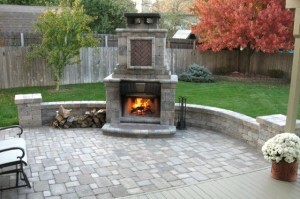 So LSI will check your local regulations and gather any required permits that may be needed to build your patio fireplace. It Enhances Entertainment: By adding a fireplace on your patio, spring, summer & Fall entertaining can happen indoors and outdoors. This provides you with an extension of living space that will enhance parties and cookouts. People are naturally drawn to the flames of a fire. 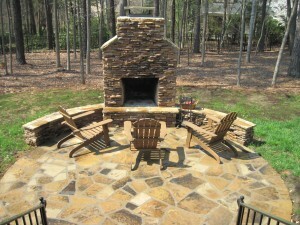 As a result, an outdoor fireplace will usually become a gathering place for your guests. It Provides an Alternative to a Grill: Most people nowadays have gas grills. An outdoor fireplace with a grate gives you added grilling possibilities. You can roast marshmallows, of course, but a fireplace gives you additional opportunities. Such as offering your family and guests food cooked on an open flame using wood or even charcoal. It Extends the Seasons: The warmth and comfort of an outdoor fireplace permit you to enjoy your outdoor living space well into the cooler months. In cooler months, you can throw on a sweater, get cozy with your beloved around the fire and enjoy a romantic night of star gazing. It Delivers Ambiance: no matter what you are doing, provides a comforting ambiance. It talks a chilly, eerie evening and provides comfort, coziness and warmth.